Lokai horses were originally developed by the Uzbek Lokai tribe from Tajikistan, formally part of the Soviet Union. Their descendents were Oriental mainly of central Asian strains such as the Iomud and the Akhal-Teke. Karabair and Bukhara horses also are in the Lokai background. 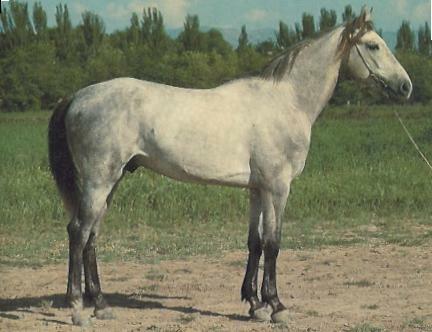 Arabian horses were later introduced into the breeding mix. They are approximately 14.3 hh. Some are smaller. Their colors range from gray, bay, chestnut, black, and palomino. The coat is often curly and has a shiny, metallic like shine. Bonnie L. Hendricks, in her book entitled International Encyclopedia of Horse Breeds, wrote: "Horses with curly coats are most often found among middle Asian breeds, especially in the Lokai." Sometimes you will see sparse manes and tails that can be traced back to the Akhal-Teke's influence. They have great variance in their characteristics. However, there is one strain of Lokai which can be traced back to a specific stallion, Farfor. He was bred to reproduce this curly coat from 1955 to 1970. He produced up to 18 foals each year that had this curly coat. These Lokai are fully curly coated from head to hoof. They have inherited a dominant gene from this stallion. "His offspring were characterized by great endurance, resistance to disease, and good adaptation to range living in the mountains... Farfor was used for a long time in the Tadzik national game, buz-kasi... Farfor was heterozygote, and to strengthen the heredity of the curly coat inbreeding was used in certain generations. As a result of many years of careful selection, a group of curly horses was obtained. Horses of this strain are curly from ears to cannons, especially during the spring and summer periods." The legs are not always properly set. The head can be quite coarse, but not always. Lokai are not uniform in their conformation. They are extremely hardy, have excellent endurance and are used in the famous game of kokpar or Bazhashi.